Why do we find Bamboo so fascinating? There are many reasons - the great number of ways it can be used for construction; musical instruments; hosepipe; decoration and food - to name but a few. A magical link exists between man and bamboo, whether he is a gardener, a craftsman, a painter, a poet, a philosopher, or all of these things. 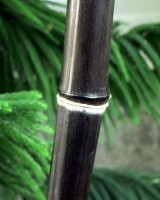 The sight, touch, shade, and rustling of bamboo calms, inspires, and enriches him. Bamboos grow successfully in most soil types and nearly all are content in either sun or shade The ideal soil for bamboos is well-drained, rich, moist and loamy. However, almost any kind of ground will do with a little preparation . Dig a hole 50/60cm deep and wide. (bigger for a large specimen). If the soil is poor, mix well-rotted manure or compost in the bottom of the hole . Remove the pot being careful of any new shoots, place in the hole and fill in with soil mixed with compost. The finished soil level should be about an inch above the top of the root ball. Firm in the plant takeing care not to stand on any new shoots, then give it a good drink of water. Bamboos love moisture but not wet or standing water. Keeping it in check don''t be put off controlling the growth is relatively easy, requiring only a few minutes of vigilance a year. There are a number of ways to limit the spread of bamboos, especially as the rhizomes usually stay close to the soil surface. simply Cut around clumps twice yearly with a spade, then remove any rhizomes which are outside where you want them. Alternatively sink in a very large plastic pot with the bottom removed then plant the bamboo inside or insert a barrier of high-density polyethylene 2/3mm thick and 60cm wide when you plant the bamboo. (the pot top/barrier must protrude about 10 centimetres above ground level). Height is even easier just bend down the cane and prune it to the height you want it. A simple mulch of compost or well-rotted manure in the autumn and a some slow release fertiliser in spring along with an occasional treat with a water soluble food such as Phostrogen. What most affects the height of the canes is the amount of water that they receive,especially in the period from late spring until late summer this is when the new shoots appear and the culms are growing. At this time keep the soil around them moist but not waterlogged.